Zelfa & Gunnar are Brazilians with several expeditions’ experience to Antarctica & the Arctic who invite you to share their polar adventures. Since 1997 we have travelled to the most extreme corners of the Polar Regions on board various icebreakers operated by Quark Expeditions, who is the original tour operador and with other ones . Together we have been on several expeditions to the polar regions, accumulating a lot of polar experience to help you choose the best option for you. We are ready to help you plan your next expedition to the White Continent. Our first adventure departed from Ushuaia, Tierra del Fuego, and the most southern town in Argentina. We boarded the Russian oceanographic research vessel 'Akademik Sergey Vavilov' to the Antarctic Peninsula. The experience was so fantastic that since then we caught the 'Antarctic bug' and returned to Antarctica every Austral summer. In the summer of 1997 we were on board the icebreaker 'Kapitan Khlebnikov' with its 25.000 hp and did the first ever Semi-Circumnavigation of Antarctica. This 28-day voyage departed from Port Stanley, Falklands Islands, and traveled to the most incredible spots in the Antarctic Peninsula including the most remote island of Peter I. On board the helicopters we landed on the Ross Ice Shelf. We also visited the US station McMurdo and the New Zealand station Scott, along with the historical huts at Cape Evans and Cape Royds. Landing at the subantarctic Island Macquire where the King Penguins live was a thrilling experience. At Auckland Island we saw the Wandering Albatross nesting. We completed this breathtaking experience in New Zealand. During the Arctic summer of July 1997 we arrived at the North Pole on board the most powerful nuclear icebreaker, the 'Sovetstiy Soyuz', with its 75.000 hp. We departed from Murmansk, in Siberia, breaking the frozen sea until reaching the exact 90º N. Gunnar was then the first Brazilian adventurer to dive in the frozen waters of the North Pole. It had been an incredible experience to reach the top of the world, knowing that very few people had ever set foot there and very few ever will. In November of 1998, on board of the small ice reinforced research vessel "Professor Multanovskiy', we went on an unforgettable voyage to South Georgia, home of the King Penguins, also known for the historical whaling stations. Here we followed the steps of the famous explorer, Sir Shackleton. It was a privilege to spend so many days in such a special remote island in the southern ocean. The trip start and finish in Ushuaia. On board the Multanovskiy during the Arctic summer of 1998, we made the "Greenland Odyssey", leaving from Iceland and sailing to Greenland, the second largest island in the world, visiting the colourful Inuit villages. It was with great pleasure that we returned on board the 'Vavilov' to celebrate the Millennium in Antarctica. On the last day of 1999 we were blessed by a spectacular show of humpback whales spouting alongside the vessel. After a delicious dinner prepared by our Austrian chefs, we went outside on the deck to celebrate the new millennium with champagne and had a great party while anchored in a beautiful bay of the Antarctic Peninsula. 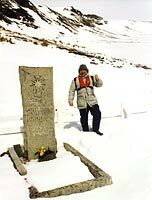 During November 2000, on board the Icebreaker 'Kapitan Dranitsyn' with its 25.000 hp, we ventured on another adventure to the Falkland Islands, South Georgia, and again to the Peninsula for 20 days. This powerful icebreaker gave us a chance to land on the frozen Scotia Sea. The highlight of the trip was when the captain went straight to the ice and we landed on it. We walked around the Dranitsyn and even had an afternoon tea on the ice. Our dream had always been to visit an Emperor penguin colony since we first started going to Antarctica. In November 2001 we boarded the. Icebreaker Kapitan Dranitsyn in Port Stanley and sailed to South Georgia and to South Sandwich Island, one of the most remote places on earth. We visited the German station Neumayer and continued on to Atka Bay in order to visit the Emperor penguins in the Weddell Sea. Being in such close contact had been our ultimate dream since we first caught our 'Antarctic bug'. We flew the helicopter over the continent and then walked about 1 km to the rookery where we sat for hours, captivated by the Emperors’ behavior with their fuzzy grey chicks. These are the only birds that live in such a harsh climate. We again realized how privileged we were to see these penguins. We sailed through South Orkneys, on to the Shetland Islands. We crossed the famous Drake Passage overlooking Cape Horn and disembarked in Ushuaia after 28 days. The Dranitsyn had become our home and we bid an emotional farewell to our fellow travelers and staff. Between the two of us – Gunnar with his recent 45-day expedition to East Antarctica (beginning Nov.26, 2002 in Lyttleton, New Zealand and spending Christmas and New Year’s at sea) and Zelfa with her 1997 West Antarctica voyage (28 days from Stanley, Falklands to the Ross Sea region and then to Lyttleton, NZ) – we have completed a Full Circumnavigation of Antarctica, sailing 29,513 Km on board the incredible icebreaker Kapitan Khlebnikov. 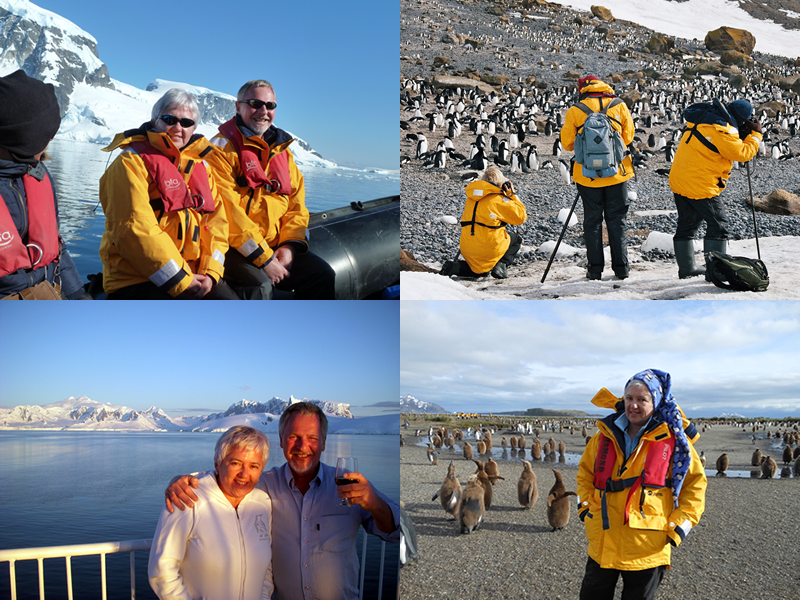 On his adventure in “The Far Side of Antarctica”, Gunnar enjoyed thousands of fantastic blue and white icebergs, hundreds of whales and seals, and visits to six emperor penguin colonies, experiencing an array of weather conditions, most of which were SUNNY! Among the remote scientific stations visited where Australia’s Casey and Davis, Russia’s Mirny, China’s Zhongshan, and Germany’s fascinating underground Neumayer. On both expeditions, the Kapitan Khlebnikov’s helicopters gave us unique, breathtaking views of Antarctica’s frozen coast. On July 2003, Zelfa was again on board of the icebreaker Kapitan Khlebnikov to visit the Siberian Arctic . Several stops were made in the Chukotka Peninsula, Russia's Far East, just across the Bearing Strait from Alaska, USA. Visited Chukchi villages, Wrangel Island, and saw polar bears, musk oxen, belugas and walruses and puffins along with many other seabirds. It was another fabulous adventure to the Arctic regions. February 09, 2004 Zelfa and her friends who live in Buenos Aires boarded the m/v Ushuaia, an Argentinean vessel as the IAATO observer (International Association of Antarctica Tour Operators) to the Antarctic Peninsula. December 9 - 15, 2004 Zelfa went again to Antarctica. This time it was a complete new adventure and a dream come through to fly to the Continent in only a bit over 3 hours. The trip started in Punta Arenas, Chile where we boarded the Dash-7 plane operated by DAP and flew to the Chilean Base Frei in King George Island. It operates the combination plane/ship in Antarctica only in the beginning of the season.It was all very exciting to land in Antarctica by plane, put on the rubber boots, walk to the other side of the island, where the zodiacs were waiting to take us to the Russian ship for 46 passengers only. The ship was our home for the next 5 days in the Antarctica Peninsula. 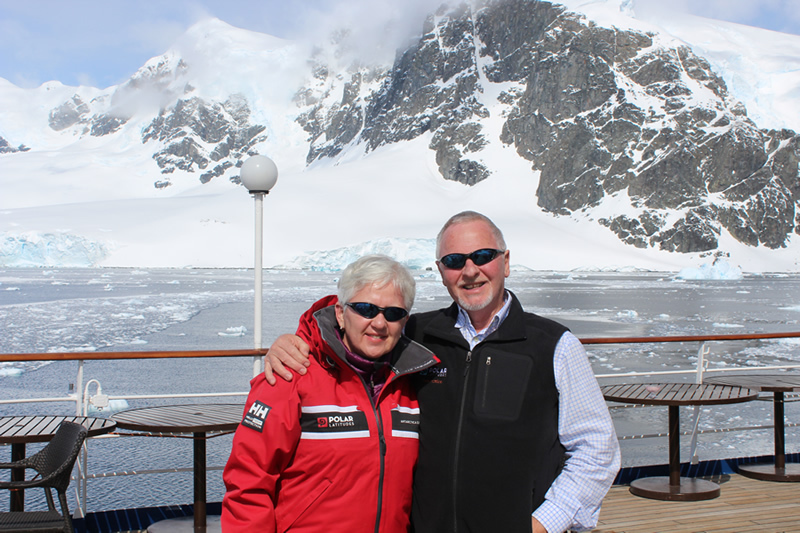 The weather was fabulous and it was a joy to see Antarctica so pristine. These voyages only operate in December. And as exciting as it's to fly, operations are totally depended on the weather, as the airplane can only fly with excellent weather conditions. Gunnar boarded once again the icebreaker Kapitan Khlebninkov in Ushuaia last December 17, 2004. This time he has completed the Full Circumnavigation of Antarctica, sailing south of the Antarctic Circle. The big event this time, it was to set foot on top of the famous iceberg B15-A and to celebrate with a cold glass of champagne. The full circle was completed by disembarking in New Zealand on January 14, 2005. December 2005 I went back to Antarctic. This time with a friend and one of my sisters. We had a marvelous time! It was a Drake Lake both ways. Beautiful & bright sunny days. We reached Peterman Island at 65º10'S 64º10'W. October 9 - 21, 2006 - Gunnar & Zelfa boarded the icebreaker Kapitan Khlebnikov in Ushuaia for a First Ever Voyage to see a new colony of Emperor Penguins at Snow Hill Island in the Weddell sea. It was the first time a tourist vessel went to Antarctica so early in the season. It was a marvelous experience to break the ice, fly the helicopters over incredible icebergs and land at the sea ice in order to walk 3 Km to visit the Emperor Penguin rookery with their young chicks on their feet. This was the real Antarctica as we experienced winds and cold of -25ºC. It was just like in the movie March of the Penguins, another unforgetable trip! Feb 20 - Mar 1, 2008. On board the Clipper Adventurer, we celebrated Gunnar´s BD in Antarctica! It was great fun to return to the White Continent at the end of the season. We loved traveling on board the Clipper. She´s an awesome ship!!! September 20 - 24, 2008. We boarded the Mares Australis in Punta Arenas, Chile to sail through the last channels of Chile and disembark in Ushuaia, Argentina. We landed at Cape Horn, the most southern point in South America. This was the main reason for doing this trip as some many times in Antarctica and we could only land at Cape Horn with a Chilean vessel, and we did it! Worth the trip! Another beautiful spot in the world! Jan 2011: this time we flew from Punta Arenas , Chile for 2 hours the Drake and landed at the Chilean Base Frei where we disembarked with our rubber boots and made our way to the Ocean Nova. We sailed 3 full days in the Peninsula with incredible sunshine. Since this was a short trip, there were many landings and zodiac cruises. We got very near to humpback whales several times. Stopped for the first time at Puerto Williams to do immigration before arriving in Ushuaia and visited the southernmost yacht club and have delicious pisco sours with honey! 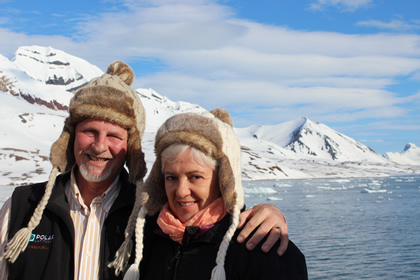 Gunnar & Zelfa wanted to sail the largest ship we ever sailed in the polar regions. We did the Falklands, South Georgia & Peninsula cruise. The Ocean Diamond, is very stable in the Drake. The cabins are also very comfortable. Because it's a large ship, it also offers opportunity for more adventure, such as Mountaineering, Skiing, Kayaking and Camping in Antarctica 1 night. Even big, there's space for everyone and it was another very pleasant experience. We sailed on board the Sea Explorer operated by Polar Latitudes to a Peninsula trip Nov 18-28, 2015. We wanted to experience the personalized service that Polar Latitudes is offering, with a real care on details. The idea of being in a small group, passengers came from all over the world, fascinating. Thanks to Polar Latitudes for maintaining the original idea of the Antarctic tourism. Next season this same ship comes back to Antarctica completely refurbished and under a new name: Hebridean Sky. 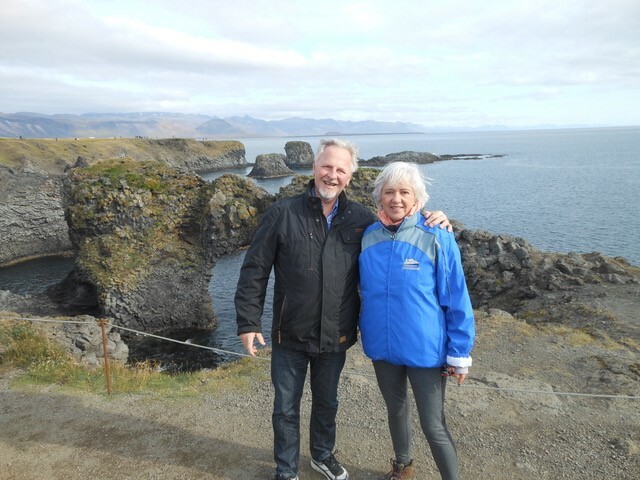 We board the Ocean Nova in Edinburg, Scotland on May 29th 2016 to the Shetland Islandsand then to the Norwegian fiords and cost line until we arrived in Spitsbergen where we saw polar bears, walrus and many sea birds including the puffins. We disembarked in Longyearbyen the most northern airport before going to the North Pole.